In Nepal, this is Asar, the month of paddy plantation. 15th of Asar is celebrated as "Ropain Diwas" or "Paddy Plantation Day". As soon as the monsoon begins, farmers start planting paddy in Nepal. Usually, the month of Asar and Shrawan (Mid-June to Mid-August) is the ideal time for re-planting paddy. It, thus, becomes relevant to paint on these subjects at this time of year. So, here I have two watercolor paintings on the same theme. 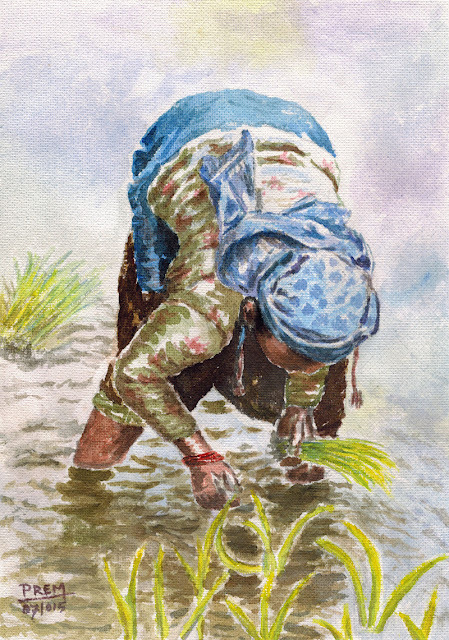 In Nepal, the cultivation of rice is still traditional and relies on manual labor to plant the paddy. 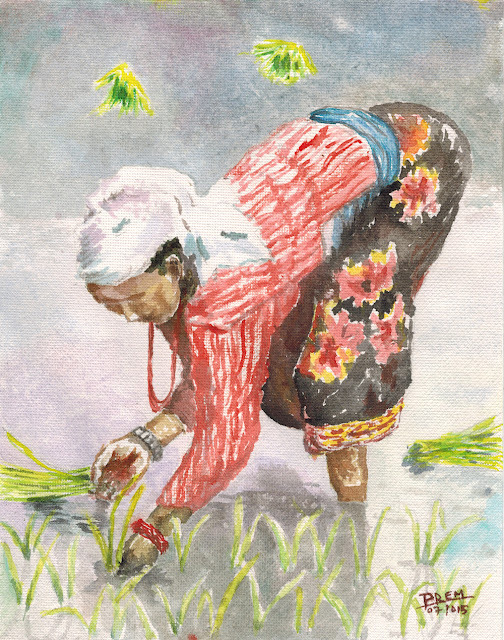 These artworks depict the same scenario of the Nepalese agriculture. I got the painting concept and reference from a calendar photograph. Both paintings are made on Handmade watercolor paper. The former is full A4 sized while the latter is cropped in its length. I've shared these paintings in my Facebook Page, my own Timeline and an Art Group "Nepalese in Art" and they have got good feedback, which has made me highly motivated to paint. Hope you will also like these two artworks of mine. Would love to hear from you in the comments.